Yesterday a few milliliters of LB+AMP broth were inoculated with some candidate colonies and the tubes were grown overnight at 37°C. Ampicillin was included in the broth to ensure that the cells would maintain the plasmid DNA. Today the cells will have grown to high density and the plasmid DNA will have undergone many replications. All the copies of the plasmid DNA in your overnight culture should be identical (“clones” of one another), since the culture began with a single colony and that colony grew from a single transformed cell. Next, you must isolate the plasmid DNA from the candidates and determine if any of the plasmids contain the truncated EGFP gene. To isolate the plasmid from the overnight cultures, you will perform what is commonly called a “mini-prep.” This term distinguishes the procedure from a “maxi-” or “large scale-prep” which involves a larger volume of cells and additional steps of purification. The overall goal of each “prep” is the same--to separate the plasmid DNA from the chromosomal DNA and cellular debris, allowing the plasmid DNA to be studied further. In the traditional mini-prep protocol, which you will perform today, the media is removed from the cells by centrifugation. The cells are resuspended in “Solution I” which contains Tris to buffer the cells and EDTA to bind divalent cations in the lipid bilayer, thereby weakening the cell envelope. A solution of sodium hydroxide and SDS is then added. The base denatures the cell’s DNA, both chromosomal and plasmid, while the detergent dissolves the cellular proteins and lipids. The pH of the solution is returned to neutral by the potassium acetate in “Solution III.” At neutral pH the SDS precipitates from solution, carrying with it the dissolved proteins and lipids. In addition, the DNA strands renature at neutral pH. The chromosomal DNA, which is much longer than the plasmid DNA, renatures as a tangle that gets trapped in the SDS precipitate. The plasmid DNA renatures normally and stays in solution, effectively separating plasmid DNA from the chromosomal DNA and the proteins and lipids of the cell. release a fragment that can be visualized on a gel. Fragments smaller than 100 basepairs or larger than 2 kilobases are difficult to judge accurately on agarose gels. release differently sized fragments depending on the orientation of the insert. work best in the same buffer and at the same temperature. This last rule is breakable but it is makes your labwork more complicated if you must change buffers or perform the reactions sequentially, at low then high temperatures. Sometime before you leave today you should count or estimate the number of colonies that arose from your transformation reactions. One of the teaching faculty has set up four overnight LB + AMP cultures of bacteria for you to work with. Three of these cultures have colonies from the ligation reactions you have been preparing (if your reactions were unsuccessful then you have been provided with candidates from other reactions). One of these cultures has grown from a colony of bacteria with pCX-NNX. Plasmid from this culture will serve as a control for today’s digests and will provide a suitable comparison pattern on the agarose gel you will run next week. Label your three candidate cultures 1, 2 or 3 and four eppendorf tubes (control, 1, 2, or 3). Vortex the bacteria then pour some into the appropriate eppendorf tube so that the tubes are almost full. 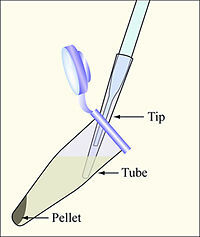 If you are nervous about pouring the liquid, you can use your P1000 to pipet 750 μL into each eppendorf twice. Either way, the eppendorf should be quite full when you try to close the cap. You can wear gloves to keep the bacteria from splashing your skin or you can wash your hands after closing all the caps. Balance the tubes in the microfuge, and then spin them for one minute. Aspirate the supernatant, as shown, removing as few cells as possible. Resuspend the cells in 100 μL of Solution I, changing tips between samples. Prepare Solution II by mixing 500 μL of 2% SDS with 500 μL of 0.4M NaOH in an eppendorf tube. Add 200 μL of Solution II to each sample and invert the tubes five or six times to mix. In some cases the samples may appear to "clear" but don't worry if you don't see a big change. Place the tubes on ice for five minutes. Add 150 μL of Solution III to each tube and immediately vortex each tube for 10 seconds with your vortex set at the highest setting. White clumps should appear in the solution after you vortex it. Place the tubes in the room temperature microfuge and spin them for 4 minutes. While the tubes are spinning, label another set of eppendorf tubes with the plasmid names and your team color. A white pellet should be visible when you remove your tubes from the microfuge. Use your P1000 to transfer 400 μL of each supernatant to the appropriate clean eppendorf tube. It's OK to leave some of the supernatant behind. Avoid transferring any of the white pellet. Add 1000 μL of room temperature 100% ethanol to each new tube. The tubes will be quite full. Close the caps and invert the tubes at least five times to thoroughly mix the contents. Microfuge the samples for 2 minutes. It is important to orient your tubes in the microfuge this time since the pellets from this spin will be barely visible. Remove the supernatants using your P1000 or the aspirator, but be careful not to disturb the pellet of plasmid DNA that is at the bottom of the tube. Remove as much of the supernatant as possible but you do not need to remove every drop since you will be washing the pellet in the next step. Add 500 μL of 70% ethanol to each pellet. Spin the samples one minute, orienting the tubes in the microfuge so you will know where to find the pellet. Immediately remove the supernatant with your P1000, making sure to keep the tip on the side of the tube that doesn't have your pellet. Remove as much liquid as possible, using your P200 set to 100 μL, to remove the last few droplets. To completely dry the pellets, place your rack in the hood with the caps open for a few minutes. When the pellets are completely dry, add 50 μL of sterile water to each sample and vortex each tube for 2 X 30 seconds to completely dissolve the pellets. The liquid can be brought back to the bottom of the tubes by spinning them in the microfuge for a few seconds. You will perform a diagnostic digest on three of the four plasmids you have prepared (one sample will be the pCX-NNX parent and you'll choose 2 of your 3 candidates to pursue) to see if any have the PCR insert. Use information from the lab manual, the NEB catalog and the plasmid maps you’ve drawn to choose the enzymes you’ll use. The following table may be helpful as you plan your work. Prepare a reaction cocktail for each of the above reactions (uncut, singly cut with enzyme 1, singly cut with enzyme 2 and doubly cut with Enzyme 1 and Enzyme 2) that includes water, buffer and enzyme. Prepare enough of each cocktail for 4 digests. Leave the cocktails on ice. Aliquot 5 μL of plasmids (pCX-NNX and 2 of your three candidates) into a sets of well-labeled eppendorf tubes. The labels should include the plasmid name, the enzymes to be added and your team color. Add 20 μL of the appropriate cocktail to each tube. Flick the tubes to mix the contents, then incubate the mixtures at 37°C. While your samples are digesting, you can start reading the guidelines for working in the tissue culture facility, where you will work next time. We will also have a visitor from the environmental health and safety office (EHS) come to discuss tissue culture work with you. If you have even more time, you should also refamiliarize yourself with the requirements for the upcoming progress report that you will prepare to describe your work in this experimental module. Before leaving lab today, please add 2 μL of loading dye to each of the digests you have assembled. Store the digests and the DNA at –20°C and return the remainder of your bacterial cultures to one of the teaching faculty. Prepare a table with the results of your ligations and transformations. Calculate your transformation efficiency (# colonies/μg plasmid DNA) based on the transformation you performed with pCX-EGFP. In three or four sentences, interpret the ligation results. This table and your legend will be included in your progress report as Table 1. Read the guidelines for mammalian cell culture. Next time, you will begin your work in the tissue culture facility. Exchange the writing assignment you handed in today with your lab partner for comments/reactions. Begin by reading the tips for peer review from Neal Lerner. Then, as you read your lab partner's writing, be a thoughtful and sensitive reviewer. You will do your partner a disservice if you say the writing is great when it's not. Similarly, you will waste your time adding comments that are too harsh or too obscure to be integrated into a revision. During your review, find at least one good example in the background/aims/results/plans/figures sections. These will be a starting place for discussion so know what it is you think makes the writing strong in the passages you've identified. Bring the reviewed report with you to the next lab session. This page was last edited on 24 September 2009, at 19:35.